So, my cheesecake pops were frozen solid today, I didn't need to have worried about them at all. And the bamboo skewers stuck firmly into them too. After I made the caramel walnuts the other week, I realised that making lollies requires some sort of holder to hold up the sticks, so I invested in a couple of circles of florist's dry Oasis - a dry spongy material used for floral arrangements and worked very nicely to stick my pops in while the chocolate was to set. The dry variant is a bit dusty, so I wrapped it with clingfilm and made sure to wash my hands, no idea what it's made of. I melted half the amount of chocolate with half the amount of vegetable fat, mainly because I wasn't sure all would fit into my bain marie bowl. I'd also bought a (for me) large amount of sprinkles. I always look at them in the shops, wishing I could buy them and not really having a reason to. So I was rather miffed when last Friday I joyfully walked up to the isle where they are kept only to find that there were only Barbie themed ones! Though a little bit of digging around at the bottom shelf uncovered a dusty container with "no artificial colourings" sprinkles. So I bought one Barbie and the dusty one. Luckily I had some candied violets at home. And so, with the chocolate ready melted and all my sprinkles lined up, I took out a few pops at a time from the freezer, unwrapped the cling film and dipped in the chocolate. Which set oh so fast and the sprinkles so didn't want to leave their containers. The round pops were the best for dipping, the square ones needed a bit of help with a spoon. Also keeping in mind that a lot of Daring Bakers had had trouble getting the sticks to stay, I wanted to make sure to cover the pops completely with chocolate, once it set, I reckoned it would keep the stick in place. Looking at the photo, I realise that I should not be let loose on innocent pops with such a big choice of sprinkles. I just try to put on as much as possible. Silly. Half way through the dipping, I got the idea to dip in dessicated coconut, which worked out OK (taste remains to be found out). Then I thought why not try sesame seeds and ground almonds, but neither looked very attractive, so I only made one of each. Cut the bamboo skewers in three, the sticks were a bit too long. Bake the cheesecake a bit longer still. Leave the cheesecake in the freezer overnight. Plan decorations in advance and dip the pops rather than sprinkle on them. Try toasted chopped hazelnuts and candied rose petals. Also work out a way to store them in the fridge, today I placed them as close as I could on a couple of plates, placed a piece of kitchen tissue on top and covered with cling film. Hopefully the sprinkles won't go too soggy. This was a great challenge! I had a great time, and I'm sorry that I didn't make the pops earlier. The other day I made the third batch of müsli bars for Lundulph to take with him on his way to work. All according to the third version of the müsli bars. The second batch was done in a rush and I'd forgoten the honey and also I kept the bars in the oven too long and they went very dry. This time, I remembered the honey, baked them for an hour and a half which dried out the surface, but left them fairly soft inside. Since I'm freezing them, they don't need to be completely dry. I've also worked out a method on shaping them. The muffin tins are just too big. Instead I use my ice cream scoop to get 6 - 7 scoops onto a piece of cling film. I then roll it up into a sausage, compressing the mixture as much as possible. I use the empty cardboard roll of a kitchen paper roll, put the müsli sausage with the clingfilm into the cardboard roll and compress it even further. I then take the müsli sausage out and leave it to cool, after which I slice it with a serrated knife and then bake on low to dry out the pieces. From the standard recipe, I got 7 of the sausages, so not too bad. In the old days when Lundulph would eat breakfast at home, we'd get through one batch in 2 weeks. I regret a bit that I thew away the dough hooks of my electric whisk, they would have been handy to mix the mixture for the müsli bars. Once again, despite no lack of enthusiasm, things got in the way and I left the challenge to the very last minute. I wasn't able to find cream cheese, and looking around on the internet, it seems to be uniquely American and the closest to it in Europe is mascarpone. So that's what I bought. Quite lucky really, because just when I was in the shop, I realised that I'd forgotten to look up the equivalent, so just went for the mascarpone. Pot luck! But here it is, Daring Bakers April 2008 Challenge which is Cheescake Pops from the book Sticky, Chewy, Messy, Gooey by Jill O’Connor. The hosts this month were Elle & Deborah. The recipe was originally given in American quantities, but I have re-calculated in metric. Select two oven safe pans, one should be able to fit into the other and there should be room for water - this chesecake needs to be baked in a bain marie. My smaller pan is 32 cm x 22 cm x 5 cm. The original recipe called for a round non-spring form of 10" (25.4 cm) diameter. Place the larger pan in the oven and preheat on gas mark 3 (160 degrees C). Boil up some water in the kettle to have it ready for the baking. Combine the mascarpone, sugar, flour and salt in a bowl, whisking at the lowest setting. Add the eggs and egg yolks, one at a time. Finally add the vanilla extract and the cream. Grease the smaller pan and transfer the batter into it. Place the smaller pan into the larger, preheated one and pour hot water into the larger one, until it reaches at least half way up the sides of the smaller pan. Bake in the middle for about 60 - 80 minutes, until the cake goes firm and light golden. Let the cheesecake cool to room temperature - I speeded this up by resting the pan on ice blocks. Then I put it in the freezer for it to firm up further for about 4 hours and 30 minutes. Then I cut it up into small-ish pieces and threaded on bamboo skewers, that I'd cut in half. At this point, things became a bit more difficult than I'd expected - either the cheesecake hadn't baked sufficiently and was too gooey in the middle or four and a half hours in the freezer wasn't enough or both. I started cutting in squares, but the knife had a lot of cheesecake stuck to it and their shape was ruined. So I took out the outer ones that were in a decent-ish square form and the rest I rolled into balls with my hands. Had to give up on the very last one, it was just too loose and creamy. At this point also the skewers didn't want to stay in either and so I decided to wrap each in cling film and leave in the freezer overnight, hopefully they'll go firmer and I'll dip and decorate them tomorrow. It's getting late and it's a school night. Tomorrow I'llmelt the chocolate over another bain marie, this time on the hob. Mix in the margarine with the chocolate - this makes it easier to use apparently. Then I'll dip the cheesecake pieces into the chocolate, shake off the excess and sprinkle with the decorations. Finally they need to chill for at least 24 h before serving. The should also be stored in the fridge. By the time the cheesecake had finished baking, it had swollen up to be slightly above the edge of the pan, but not in any danger of overflowing. Once it started cooling, it sunk back into the pan. If you are using a round cake tin, the main reason for not using a springform is that these often leak and there's danger of it doing so in the bain marie. Though some of the fellow Daring Bakers have used one anyway and it had worked out fine. When you first start whisking the batter, it'll be fairly thick and in my case at least a bit lumpy, but as soon as I added the eggs, it went nicely smooth. Lundulph got to lick the bottom of the bowl and said it tasted like custard. After having fun and taking part in Art You Eat in March, I was completely set on keeping it up along with the Daring Bakers. But when the theme for AYE #3 was announced, I got a bit of a mental blockage - what to do with local produce that looks nice? I think I make fairly good food, but plating has never been my strong side, as most of the photos on the blog can tell. So over the next few days I kept scratching my head and unable to think of anything at all that would fit. Luckily I got inspired when we were invited to Fred & Ginger the following week for a sushi night. Now I'd done a Japanese dinner party many years ago with a friend of mine and we'd spent some 8 hours preparing all the food. Obviously we'd missed one of the points with a sushi night - that the guests help with the "making of". Anyway, it was nice and there were other things to eat as well, since I'm not a big fan of seafood and fish, I made a veggie sushi roll. Still the seaweed was fishy tasting. And here's where I got the idea - sushi made with local ingredients. Local in this case being UK. Now as far as I know, rice is not grown on a commercial scale in this country, if at all. So this would be the first thing to substitute - wheat. In Bulgaria wheat is boiled whole, then mixed with spices, sugar, breadcrumbs and fruit and served in church at special holidays. And when while wheat is boiled, it swells and bursts and releases loads of stickiness, so this should work out fine. Next thing to change was the nori (dried seaweed). I'm not aware of an equivalent thing in Europe, but in addition to keeping the sushi rolls together and providing some flavour, it also gives a nice colour. Lundulph suggested cabbage. I wasn't convinced, but didn't have a better idea so that's what it was going to be. Third thing to change was the fish. I'll repeat once again - I don't like fish much. Also not sure what fish would be available, if any, the coast isn't that close and our local river has probably more shopping trolleys than fish in it. So it was going to be chicken and beef, cut in thin long strips and quickly fried. So with a shopping list of the above and the generic item "colourful vegetables" we went to our local farm shop. It's very posh, always crowded on week-ends and has lots of interesting things that are extremely tempting to buy. The first thing I spotted was gigantic spinach leaves and with them the nori problem was resolved. But the red cabbages looked nice too and I put one in the shopping basket as well. On to herbs - all the fresh ones were from Guernsey and that didn't feel local enough, so I let them be. The meat was very local indeed, but they didn't have the right cut for what I needed. I got a bunch of carrots and cucumber, both locally grown and rather pathetic looking I might add. Further into the shop I spotted packets of various grains. They had them all except wheat. The closest was spelt wheat and having had good experience with it in baking, I thought I'd use that just as well. There was a plethora of sauces and chutneys and I should have taken time to pick some nice local ones out, but I didn't unfortunately, rooting for the jar of horseradish sauce I had in the larder. The friendly butcher explained that the beef was from Scotland and the chicken from Norfolk. It could probably have been a bit more local than this. First thing was to wash all vegetables and let them dry, particularly the spinach. The next thing to do was to boil the spelt wheat and the packet recommended 1 part spelt wheat with 3 parts water per volume. Or stock. I opted for stock to get some flavour, since I wasn't going to marinade the meat. Vegetable stock from Oxo. The packet also recommended simmering for 1 hour and 30 minutes. I boiled some water in the kettle, measured up 3 dl spelt wheat and rinsed it. Then into a pot, crumbled 5 Oxo cubes over it and covered with 9 dl boiling water and left it to bubble under cover. About an hour later, the spelt wheat tasted rather nice and salty, but there was still plenty of liquid left, so I left it on. 15 minutes after that and it was beginning to burn, so I took it off the heat and drained it. To make sure I also spread it onto some kitchen paper. In hindsight, this was not necessary, but wasted valuable time scraping it off. Hopefully not too much paper was left in the spelt wheat after this. At this point Lundulph came home from work, sniffed from the kitchen door and joyfully proclaimed that it smelt very nice and that he was hungry. So a quick rescue was needed. I skipped the spelt wheat and rolled up the vegetables and the meat - beef in the spinach leaves and chicken in the cabbage leaves. By the way, the cabbage leaves were quite hard and I used tooth picks to keep them in cone shapes. For the spelt wheat, I put cling film in a ramekin, filled it with the spelt wheat and pressed it in, then pulled out the cling film a little, tipped the whole thing onto the middle of the plate and pulled off the ramekin while holding on to the cling film. Once the ramekin was removed, I removed the cling film. Saved on washing the ramekin. I really should invest in some metal rings for shaping purposes, I really should. Now the horse radish sauce - I really should have made my own. I bought the jar earlier this year with the intent of trying it out. Well, it was a disappointment - it tasted like mustard but had a sort of fibrous texture. Maybe it had gone off, though it was well within it's best before date. So we ended up having sweet chili sauce as is traditionally used with spring rolls. Which made a world if difference taste wise, especially the beef "wraps". I'm not sure if should post this for AYE #3. It was tasty but only because it failed miserably and I gave up and reached for the exotic dipping sauce. Not local at all. I complained abut the lack of stickines of the spelt wheat to my Mum and she reckons that I should have used regular modern wheat, which is stickier, especially when overcooked. In theory, though, all ingredients can be provided locally and later in the year, peppers and fresh herbs would also have been available in the garden, to add flavour. I still need to think about dipping sauces to get the sweet, hot and tangy edge to things. I don't think rhubarbs are as popular in Sweden as they are in the UK. In Bulgaria these are called ревен (pronounced reven) and are mostly used as a medicinal plant. We have rhubarbs in our garden and last year I harvested and froze them and talking to my Mum about what to do with them, she sent me a recipe of a rhubarb cake that she'd had at a friend's house and that she thought was really good. A Swedish rabarberkaka that is. So finally I made it today. In fact I was planning on making it on Wednesday already and had defrosted the rhubarbs, but other things got in the way. I've only had rhubarb cake once many years ago and remember it as very yummy and not enough for seconds. I also haven't been able to fin potato flour yet, so used cornflour instead. Cut the rhubarbs into 1 - 2 cm chunks if using fresh ones and mix well with the potato flour/cornflour. Butter a cake tin and cover with ground almonds. For my amounts I used my large 13" round tin. Set the oven to pre-heat at 175 degrees C or between gas mark 3 and 4. Blend the almonds, flour and baking powder thoroughly. Whisk the eggs and sugar into a pale and fluffy cream. Then slowly add the butter. Now gradually add the almond flour mixture. The resulting batter should be fairly thick and look a bit lumpy from the almonds. Finally add the rhubarbs and stir in carefully with a spoon. Transfer the cake batter into the cake tin and level off the surface as much as possible. Bake at the lowest level in the oven for 2 hours and 15 minutes and cover with tin foil if it starts going dark. We are going to have it with the clotted cream I made a few days ago. This will run out a lot quicker than the cake, but I have some nice fresh custard to continue with. I think we'll need to invite the neighbours over to help us with the cake, it's very big. The original amounts should bake in 60 minutes, but since I almost doubled the amount, baking took a lot longer. It seemed ready after 2 hours, but I gave it 15 minutes extra to be sure. Test the usual way by sticking a skewer through the middle and checking that it comes out clean. It turned out to be very tasty indeed and was very nice with the home made clotted cream. I've read about the Indian type of ice cream some time ago and it seemed very intriguing and after my second attempt at clotted cream, I couldn't find it in my heart to throw away the leftover milk. So it was the perfect opportunity to try out this delicacy. I'd never had this at Indian restaurants, so I wasn't sure what to expect. I used the recipe from my Classic Vegetarian Indian Cookbook. Now remember that I used Jersey milk (fat content 4.5%) that had been mixed with some 280 ml extra thick double cream (48%), then left to stand for 12 hours, then kept in a bain marie for some 3 hours, then cooled down and kept in the fridge for over 48 hours. I will try this out with regular milk and see if it performs as well. Peel the cardamom pods and grind the seeds. In a pestle and mortar, grind the saffron. Place the milk in a dish of at least the double volume of the milk and bring the milk to boil on high, while stirring almost constantly so that no skin forms and the milk doesn't burn to the bottom. When the milk boils, reduce the heat to medium and add the saffron. Keep stirring until the milk is reduced to abut 400 ml, i. e. less than half it's original volume. This can take some 40 - 60 minutes. At some point, the milk will quite markedly go thicker, the consistency should be a bit like Bechamel sauce. Take it off the heat and stir in the sugar and the ground cardamom. Leave to cool completely or dip in cold water while stirring, to speed things up. Place paper muffin cups in a muffin tin and distribute the kulfi into them. 1 litre resulted in 5 and a decent amount of licking the bowl. Cover the surface with crushed raw pistachios and place in the freezer for at least 4 hours. The kulfi is traditionally placed in special conical moulds, but I don't have these and the book suggested using muffin tins instead. These I have, but they are non-stick and I didn't want to scrape the tin while struggling to get the kulfi out. So I put paper muffin cups in the muffin tin. After the freeze, the kulfi had expanded, but placing the muffin tin under a hot tap for a couple of seconds loosened things up. I'll come back with an update on how it works with regular milk, that hasn't gone through the clotted cream making stage. Stirring for about an hour sounds tedious, but it's really not too bad at all. We had some for dessert today and it was very creamy and smooth and tasty. Perhaps reduce the amount of cardamom. And I'd like to try out some other flavours as well, I think vanilla and cinnamon would work very nicely too. It could perhaps do with a little bit more sugar, but both Lundulph and I thought it's nice when it's not too sweet. To serve it, because the kulfi hasn't been churned, it should be cut up into pieces, to make it a bit easier to eat. Lundulph didn't want me to do this entry because he was worried that a restaurateur might steal the recipe. He thought it was very tasty indeed. The other day I attempted making clotted cream again. This time I looked through all the bottles of Jersey milk and picked the one that had about 10 cm of cream at the top. I also bought a small tub (280 ml) extra thick double cream. I followed the procedures as before, but I stirred in the milk into the cream and got it thoroughly mixed. I also skipped the metal plate and put the pyrex dish straight into the bain marie. And I checked with a thermometer and I was right, the milk got up to around 75 degrees and it needs to be 82. Given my readings about milk lately and some experimentation, this may well be the cause of some of the problems. Also I'm sufficiently removed from dairy farms not to be able to get hold of fresh milk anyway. Our local dairy ships the whole lot to a far end of the country where it's made into fancy ice cream that's shipped back and sold at the local cafes. But the extra cream made a difference - I now got about 2 dl and it sure tasted nice. So next step will be to not bother with milk at all, but go straight for the extra thick double cream (about 48% fat content). After skimming it off, the remaining milk still seemed to have quite a bit of fat in it and I really didn't want to throw it away. So tonight I'm making kulfi, which is an Indian ice cream. It's all very exciting and I'll blog about it tomorrow. In the mean time, I'll be thinking happy thoughts at not wasting food. I'm not sure what to call these. Lundulph suggested toffee walnuts, as they are on the same line as toffee apples, but it's not toffee, it's caramel. He also suggested we call them caramel walnut kebabs, because the walnuts are on a skewer, but it sounds too silly. Pops, I suppose, but it's a bit too American for me. Anyway, I had these delicacies in 1991, when I went to Vienna for a week. They had them at a stand outside the St Stephan's Cathedral and luckily I discovered them on the very first day. Needless to say, I kept going back every day for more. The concept is very simple, but it does take a bit of an effort to do it, the steps are fiddly. First I cut a number of bamboo skewers in half. Then I threaded six walnut halves on each. This is difficult to do on the walnut halves in the shops that I normally frequent. Now sadly I have not come across fresh walnuts yet, the best I could do was Sainsbury's Taste The Difference Serr Walnut Halves. They seem to be a bit fresher than most. In Bulgaria, fresh walnuts from this year's harvest are sold on the food markets and they have a quite distinct flavour - fresh and moist and a bit greenish as if still alive growing on the tree. A bit chewy perhaps. And this would make skewering the halves very easy. And the walnut halves I used were sort of in the right direction. I tried with some of the ones I use for müsli and out of the 10 I tried, 8 broke. Either way, patience and care is required. Once all the walnuts were on the skewers, they are to be covered with light caramel. And here I discovered that I have a slight fear of caramel. I've done that to glue gingerbread houses together and always ended up with horrid burnt stuff. But now that I have my Cordon Bleu book, I followed the recipe for caramel and it worked out perfectly, I don't think I've ever managed it so well. Although the book recommended to use the old fashioned ways of determining the stage of the caramel, I was not in the least tempted to dip my fingers in boiling sugar. Luckily, my trusty sugar thermometer came in handy. Normally I use it when I make yoghurt, he, he. For caramel, a heavy sugar syrup is to be made. For the caramel, use a stainless steel saucepan with a thick bottom. Take a second, larger saucepan and place the smaller one inside, then pour water into the larger one, about half way up. Take out the smaller saucepan, put the caramel ingredients inside and put on the hob and bring to the boil. If you have a sugar thermometer, put it in as well from the beginning. If you have freezer blocks, put one or two in the water in the larger saucepan and have some ice cubes prepared in the freezer. This is to prevent the sugar from going too hot and burning. Once the sugar has dissolved and the syrup is transparent and bubbles, turn down the heat to low and leave to simmer, swirling the saucepan every now and then. It will take about 30-40 minutes for the water to boil off, but it gives more control over the caramel. When the sugar temperature reaches 160 degrees C (almost in the middle between the markings for "hard crack" and "caramel"), it should have started to go a bit golden in colour. Put ice cubes in the larger saucepan, take the sugar off the heat and straight into the larger saucepan. This will stop the sugar temperature from rising further. Now hold a walnut skewer over the caramel and with the help of a wooden spoon, drizzle some of the caramel over it, turning it around to get caramel on all sides. Put aside on a piece of aluminium foil to set and continue with the next skewer. You need to work fairly fast, but if the caramel starts setting, just reheat it again, with the thermometer in the saucepan and stirring around to get all parts to dissolve. Don't forget to plunge the caramel saucepan into the iced water again. Once they are set, the skewers should be stored in an air tight box, as the caramel will pick up moisture from the air and may go soggy. Lundulph and I had one each for dessert after dinner tonight and it was rather nice. The originals from Vienna had been completely dipped in caramel, but this worked out very well too. Now that I have made the caramel successfully, I'll be experimenting a bit more with that. Having kept a number of vegetables in the fridge for days with the (good) intention of making either a soup or roasting them, I finally got my act together and did the latter last night. Peel all vegetables, dice the onion and press the garlic into a deep baking pan. Slice the carrot thinly, the Jerusalem artichokes and courgettes a bit thicker and add to the pan. Drizzle the grapeseed oil and add rosemary, salt and pepper and stir well to get everything nicely coated. Roast in the oven for 40 minutes on gas mark 6 (200 degrees C), stirring a couple of times during the roasting. 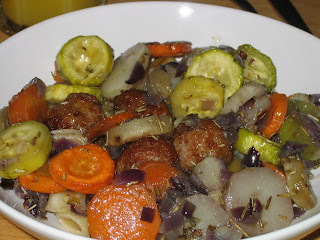 The fusion part comes from adding some Swedish meatballs halfway through the roasting. They were straight from the freezer, but that worked out fine. And I served with brown penne pasta, which I sadly also put too much olive oil into. So overall, it tasted greasy, but not unpleasant. Could have used a bit more salt too, we tend to be on the careful side with salting in an attempt at eating healthily. Today is Friday and so we'll be having a nice big salad and sujuk with a nice rakia too.